Situated on over 500 acres in the beautiful rolling hills of Holland, NY we offer breath taking views, a family oriented atmosphere, miles of hiking and biking trails, and activities for everyone in the family as well as deluxe amenities for our cabin rental guests. As a guest you will have complete access to all of the amenities at Three Valley Campground including our clubhouse, The Longhouse, the teen center, two lakes, and pool. 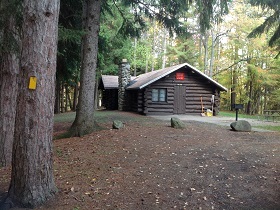 Make a cabin rental at Three Valley Campground your vacation destination and enjoy camping with all the comforts of home! Our deluxe cabins include electric and water, in-door shower / bathroom and full kitchens. Pots, pans, dishes, silverware, coffee maker, and toaster are supplied. 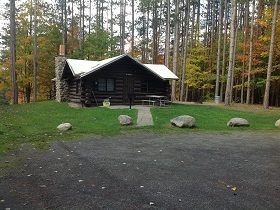 *WE DO NOT SUPPLY sheets, blankets, pillows, towels, soap, bathroom tissue, or garbage bags for any cabins. *There is a 2 night minimum stay on weekend reservations and 3 night minimum stay for Holiday weekends. *A 50% deposit is required to secure your reservation. The deposit is non-refundable and there are no rain checks or rain dates. *A cash $100.00 security deposit is due at check-in. Upon check-out the cabin will be inspected and if nothing is damaged, missing or vandalized your security deposit will be returned to you. ***Annie Oakley requires a $200.00 security deposit. Newly renovated, Annie Oakley is the perfect retreat for any couple or small group. Off the beaten path with its own private drive, this cabin has a master bedroom with a queen size bed, and a futon in the living room. A beautiful stove in the living room will keep you warm & cozy on chilly nights! Annie Oakley is a fully furnished deluxe cabin complete with a full kitchen, including a stove, refrigerator/freezer, microwave, coffee pot, and all of your pots, pans, dishes and utensils. There is also a full bathroom complete with a standup shower. You will love waking up in this beautiful cabin and having your morning coffee on the large front porch. Camping meets luxury at this updated cabin! 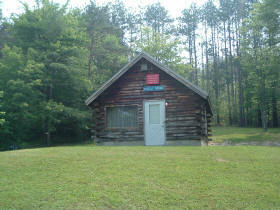 If you are looking for a more rugged cabin Daniel Boone is for you! 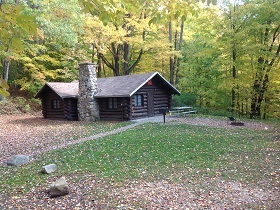 Our only rustic cabin has 6 cots, stove, refrigerator, and fireplace. There is electric but no running water. The bathroom and shower house is just a short walk! 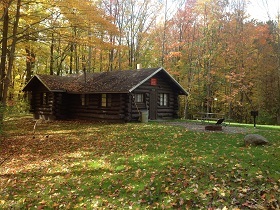 Daniel Boone is perfect for a more authentic camping experience! 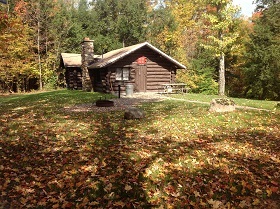 Picnic table, charcoal grill and fire ring included at the cabin! 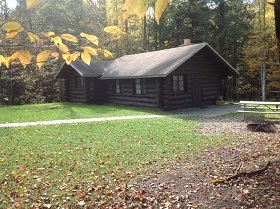 Our largest cabin, Jack Daniels, sleeps 8 and is conveniently located next to the pool and Longhouse. 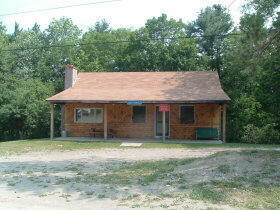 Its spacious layout has 3 bedrooms (1 Queen, 1 full size, and 2 sets of bunk beds), a full kitchen, and a full bathroom. All deluxe cabin amenities are included making this rental the perfect cabin for larger families or groups!